Thrill your children and their guests with a pirate-theme party! Kids who love to dress up might enjoy a pirate themed birthday party. 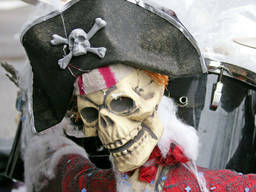 Thanks to Captain Feathersword, the pirate theme is more popular than ever, particularly among three to five year olds. Grab your pirate patch and join in the fun! This treasure hunt tutorial will show you exactly how to create a perfect pirate-themed game for your kids' pirate party! Is a pirate theme right for your kids? Does your son insist on wearing his favourite costume to the supermarket? He would probably love a boys birthday party with a pirate theme. Pirate parties can be great for children who enjoy dressing up and want to have fun. But don't forget the girls! There are plenty of pirate -themed costumes for your little princess too! As well as providing an excuse to play dress ups, pirate parties can include treasure hunts, treasure chests, skull and cross bone decorations, and pirate-themed games for kids to enjoy. Not sure if your child is old enough for a pirate party? If your child is very young the idea of pirates might be a bit confusing to them. Pre-schoolers who have seen pirates on TV and who may have done other pirate based kids' activities will probably get right into it. Worried about over-zealous sword fights and the possible injuries? You can always take a leaf out of Captain Feathersword's book and provide your guests with tickling feathers instead of pirate swords! If you don't have the time or inclination to make everything from scratch, check out your local $2 shop for pirate party plates and cheap pirate accessories. These are great for filling up the guests party bags and for pirate-themed prize ideas. With a bit of creativity and some careful planning, you can have your very own backyard full of pirates and hopefully a memorable birthday for your child!